Even if leaves were cleaned up in the fall, there are many trees (such as oaks) that shed over the winter and well into spring. It’s important to remove layers of leaves that lead to grass mold or decay. If there is a compost pile those leaves should be added to the pile, they’re excellent organic material for plant beds and mulch. After the leaves are cleaned up thatch and any grass blades that have died over the winter should be raked away. There should not be more than ½ inch of thatch. If the ground is wet care should be taken to not dig up grass seeds. Wait until a drier day. Weeds will only get worse as daylight hours increase during summer. Deal with weeds in early spring. As they grow, their roots will strengthen and they get difficult to pull out. The best way to minimize weeds in your lawn is through good cultural practices. Do not mow too short, skip fertilization, and/or over or under water. You can devote some of your lawn to wildflowers. If you wish to grow lawn grasses and not allow aggressive weeds to take over, here are the steps to take. You don’t want crabgrass to come up, or you will be fighting it all season. Very early in the spring, applying a “pre-emergent” herbicide will inhibit the type of weed seeds which germinate in the winter. The best time to apply a pre-emergent is when the temperature in the top 1 inch of soil is 55 degrees for five consecutive days. Once the soil temperature reaches 55 degrees weed seeds begin to germinate. Once you see weeds in your lawn, a pre-emergent herbicide is not effective. Broadleaf weeds are among the most troublesome problems in lawns. The seeds of broadleaf weeds occur naturally in all soils and can persist for 30 or more years. Most broadleaf weeds are prolific, producing thousands of seed per plant. If you see weeds emerge in the spring, you can spray a post-emergent herbicide. Apply broadleaf weed killer until late spring, after the weeds have flowered. (Often this is 6 to 8 weeks after a pre-emergent herbicide.) Weed killers are most effective when applied evenly over the entire lawn. A common perennial weed in early spring, dandelions can also be dug out by their roots- or, just enjoy their yellow blooms. If you are maintaining a yard without chemicals you could always harvest dandelion greens when young and tender! Note: snap off dandelion heads before they seed if you don’t want more dandelions next year. Do you have flower beds? After the winter, the soil in your garden beds may be completely compacted. It’s important to loosen the soil to help oxygen reach the plant roots. Hand tools can be used for small areas, but larger areas may benefit from tilling. A grass lawn also gets compacted soil, especially if people walk on it. If you see patches of moss or signs of decline, we would advise aerating the lawn. This can be done in the spring and fall. Moss can also mean that your lawn is getting acidic. If you are growing grass, the goal is a neutral ph. If your lawn is acidic, you’ll need to have lime applied to it. You may also want to redraw the boundary between your garden beds and grass. Wider beds mean lass lawn care, too. Once done, have bed filled up with 2 to 3 inches of mulch (pine bark is a good choice) or you’ll just get a bed of weeds! Then the beds are ready to transplant or plant perennial flowers. 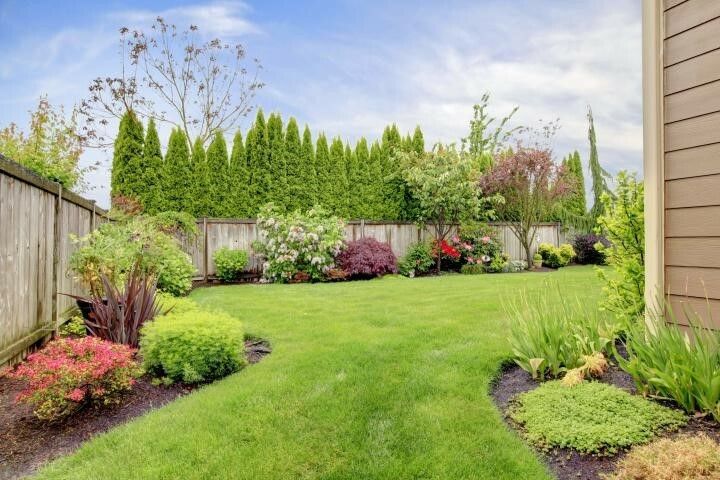 Fertilizing your lawn in the spring isn’t always necessary. The best time for fertilizing is autumn when grass plants take up nitrogen to help them green up more quickly in spring. If you are not applying a pre-emergent herbicide you still might want to fertilize in the spring (mid-April). Select fertilizers that contain slow release nitrogen sources. When you fertilize grass, apply lightly. Heavy fertilization is not good for the grass and can lead to disease problems. Cool- season grasses can be fertilized early in spring. Buy fertilizer for your type of grass, and apply it evenly. Note: that warm season grasses (e.g. Bermuda grass) can be fertilized in the late spring once they green up. After you fertilize in spring, fertilize a second time about 6 to 8 weeks later. If you’re interested in a more organic way to fertilize, a mulching mower can be used, which returns the clippings back to the soil. This saves time and energy, while also improving your lawn. Since grass clippings contain up to 90 percent water, the clippings dry up very quickly. It’s almost as if the grass clippings disappear. Plus this returns 25% nutrients to the soil a fantastic fertilizer. Seeding lawns should happen in the fall, but if your desperate to fix bare patches from traffic or pets, try spot seeding in March or April. 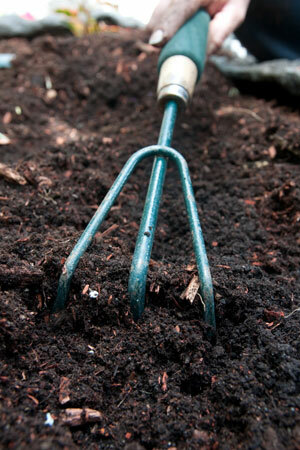 Using a rake to scuff up the area will loosen the soil. Scrape some compost into the area. 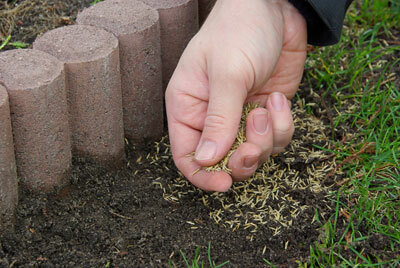 Then grass seed can be sprinkled on the spot. Use a sun/shade premium mix, unless the area’s heavily shaded. Keep the soil moist. Cover the seeds with straw matting or other material. Even grass clippings will do. You just want to cover the spot with some sort of material to hold the seeds in place. If you’re using a pre-emergent herbicide in the spring, keep in mind that it kills both weed and grass seeds; this is why fall is a better time to seed grass. With pre-emergent herbicides, a better option would be to seed any spots in the lawn, and in a few weeks shoots will grow and fill in the brown spots. If the brown patches are too big or you just can’t wait sod is the better option. Winter or early spring is the best time to trim any hedges with leaves. When you prune a shrub depends mostly on when it blooms and whether it flowers on growth produced in the same or previous years. Generally, those that flower after midsummer are pruned hard in the spring. Take care not to prune early, as the incisions can dry out if the temperature drops below freezing. Trees are ideally pruned before the leaves come out, when it’s easier to see the condition of the branches. Of course you need to prune any dead branches for safety reasons. You don’t want branches falling on people or property. Sometimes, it’s hard to see if a tree has dead branches unless you climb it. For this reason, is why you want to hire a tree trimmer to prune and dead trees every three years. Fruit trees (especially apple trees) need to be pruned in the spring to stay healthy and produce a good harvest. Mow the lawn when the grass level reaches 2 to 3 inches tall. The lawn needs time to recover after winter. However, if the grass grows to long, it shades the roots, which allows few weed seeds to sprout. If you use a traditional lawn mower, spring is the time to clean (or replace) the filter and spark plugs. It’s important to sharpen the mower blade every month or two for a clean cut. When you rip grass and leave it with open cuts, you leave your yard susceptible to fungi and disease. Of course, we have to mention that there are alternatives to grass, as well, many folks are starting to use more ground cover plants (such as sedum), walkways, and wider flower beds. There’s also a growing trend to add vegetable garden beds or to integrate edibles (herbs, vegetable, fruit) into the front yard. Once you have edges your beds and trimmed back dead branches on the shrubs add mulch (or replace the old mulch). We prefer a heavy mulch, such as hardwood bark mulches over dyed brown wood chips.